Finally, an all-in-one product that focuses on multiple ways to learn vocabulary across multiple grades! The box may be a bit on the heavy side, but that is because there is so much included. Whether your students are fans of Chipper Chat or have not been introduced to it, Vocabulary Chipper Chat is a must-have edition to your therapy materials! Continue reading to learn more about the bounty that is included in this set! One player, or the teacher, will read a vocabulary card aloud while the other students listen. Make sure the picture side is showing so that the students can use it as a visual cue. 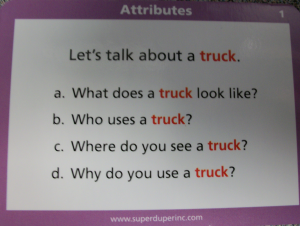 A player will then answer the question or prompt on the card. If correct, have him or her roll the die and place the associated number of chips on his or her game board. Then, play moves to the next player and the next card is read. Gameplay ends when a student fills all of his or her spaces with chips on his or her gameboard. Then, each player can wave the magnetic wand over his or her board, or the winner can use the wand to pick up all of the chips. See the video below for Super Duper's "Show Me How" video for a demonstration of the product. The instruction booklet comes with more game variation ideas and an answer key for each card. 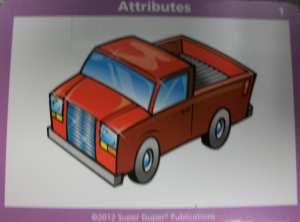 Super Duper Publications recommends this game for children ages 5-11 (grades K-5). I have at least 1-5 students in each grade whom are working on different vocabulary skills. The fact that I can use this product with multiple ages/grades/skills makes it an ideal therapy product for multi-session use. Some of my groups are focusing on the same vocabulary skills and the fact that there are multiple game boards per vocabulary skill makes it easy to use in a group session. 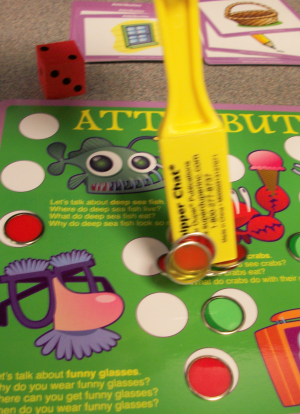 The magnetic wand, magnetic chips, and game board make the game highly motivating for my students. They are all eager to get the most chips and pick them all up with the wand! This was the first chipper chat product that I have ever used, and now I'm hooked! I will definitely be ordering more! There are 30 vocabulary prompt cards per skill which lets allows for gameplay throughout the entire session and then some! The game boards are laminated for long-term use and everything is color coded so that it is easy to find. 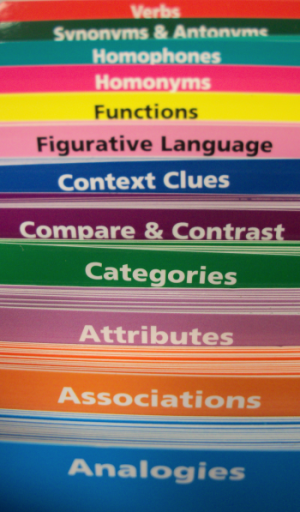 This product is aligned to the Common Core objectives in grades K-5. The instruction booklet has additional ways to use the game boards and you can definitely think of more on your own! I would love to see an expansion pack in the future because I have a feeling I'm going to be using this a lot! Articulation/Fluency/Voice - Have student(s) read the game cards aloud using their best speech sounds, fluency strategies, or vocal strategies. Have them use the vocabulary word in a sentence. 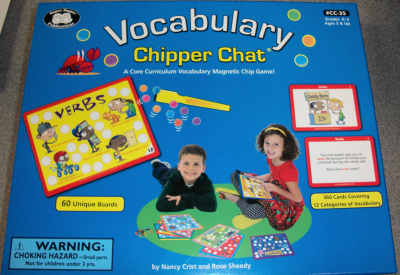 Vocabulary - This game is titled "Vocabulary Chipper Chat" so it is obvious that it focuses on vocabulary. It works on 12 different vocabulary skills. Some tasks are fill-in-the-blank, some require multiple answers to questions or prompts, and some only require one answer. All of the cards have visual pictures on one side and prompts/sentences/questions/context clues on the other. 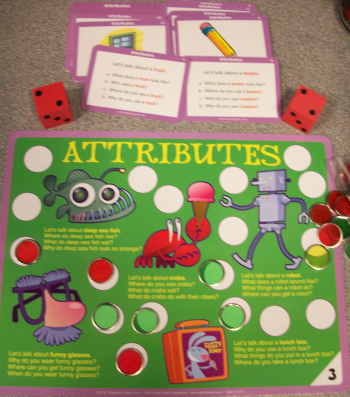 Describing - There are multiple cards which focus on describing attributes of different items, stating what they go with, comparing/contrasting items, stating items functions, stating synonyms/antonyms of items, and placing them in a category. There are also prompts on the cards. Categorization - There are 30 cards that focus on categorization skills by stating a category for a group of items on a card. Figurative Language/Idioms - There are 30 cards that focus on giving the true definition of various common phrases/idioms in the English language. Verbs - There are 30 cards which focus on the meaning of different verbs. 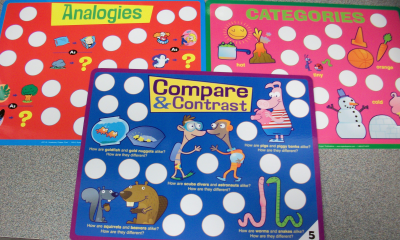 These cards can also be used with students who are working on grammatical skills. Have students use the verb in a sentence or state the past tense of the verb. 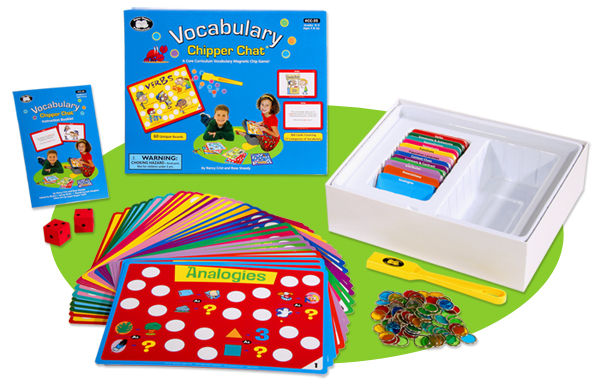 Vocabulary Chipper Chat is available from Super Duper Publications for $64.95. Extra magnetic chips and wands can be purchased as well. Consonantly Speaking was given Vocabulary Chipper Chat to review and use with students. No other form of compensation was given.